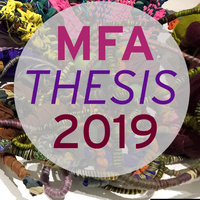 We’re proud to present the work of our 2019 MFA grads in North Adams, at one of the largest centers for contemporary visual art in the United States. The exhibition will showcase the work of thirteen MassArt graduate students in the final year of their respective Master of Fine Arts programs. Building 6, 1040 Mass MoCA Way, North Adams, MA 01247. The museum is open Wednesday – Monday 11am-5pm (closed Tuesdays). Saturday, May 4, 2019, from 2-5pm. The reception is free and open to the public (but does not include admission to the rest of the museum). *If you select to receive free museum admission tickets, they will be held for you at the door on the day of the Opening Reception until 3PM. You will need to check in with us in at the Box Office in order to receive them. Parking is available on site, and directions to MASS MoCA can be found here. Questions? Please contact the Graduate Program office at 617-879-7166 or gradprogram@massart.edu.